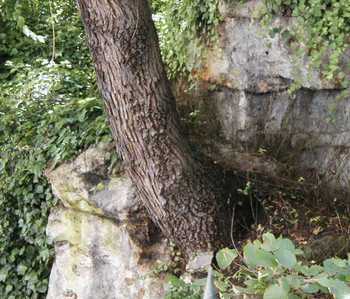 Here a very persistent tree grows out of a steep, rocky hillside on Montmartre. 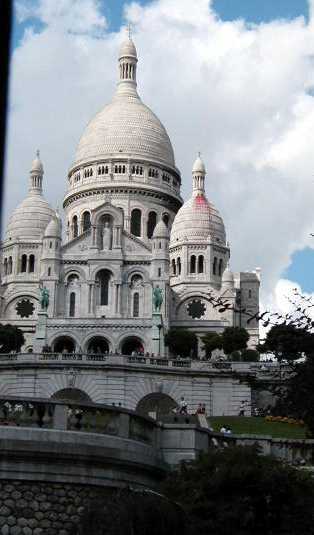 Someone has desecrated one of Sacre Coeur's domes with red paint, and nothing has been published in the news about this. I have the good fortune of cat sitting for friends this week. The cat was so lonely when I went to care for it yesterday morning that Tom and I returned in the evening to give it more company. A couple days ago, we managed to fit in a long walk on Montmartre and then through the 9th arrondissement, before stopping in at Brentano's to buy books in the neighborhood of the grand old Opera house. So, I now have new pictures to share with you over the next few days. One of the books I bought is "Balades nature à Paris," or, "Nature Walks in Paris." I've been surprised by the amount of wildlife I have seen here, and I suspect there is much more. This delightfully written and beautifully illustrated little book by Georges Feterman is what I'd hoped for. I learned, for example, that the swallows, or hirondelles, we see circling the building and screeching with delight in the evening breezes are actually martinets, not hirondelles. Hirondelles are just seen travelling through Paris near the end of April. But the martinets are plentiful in Paris. These mysterious birds almost never alight on the ground. They have the ability to sleep in flight at altitudes of over 1500 meters. They hunt flies while they fly, and they only return to feed their young when they have a big clump of flies collected in their throats. Their nests are in high, deep crevices of large buildings. A very long time ago, large mammals lived on Montmartre. Hence, a Frenchman named Cuvier went there to study their fossils in 1798. There were numerous springs there, and a rich deposit of gypsum under the surface. These conditions also attracted Druids, and later the Romans. There was an altar dedicated to Mercury there, as well as a sanctuary dedicated to Mars. From there we begin to get an etymological uncertainty for the name "Montmartre." In 840, the place was called "Mons Mercurii" by someone named Hilduin. In Abdon's account of "Le siège de Paris" in 885, it was called the "Mons Martis." In the middle of the 13th century, Jacques de Voraigne, in his "Legende dorée," refers to it by its Christian re-naming, Mont des Martyrs, referring to St. Denis and his companions. Then sometime between 1793 and 1794, it was rebaptised "Mont-Marat" in hommage to Marat, the "friend of the people." Down the hill just a bit from Sacre Coeur, in the neighborhood of Place St. Pierre and rue Ronsard, is a colorful fabric sales area. Nearby is a street where you can buy very cheap clothing that is piled in disorganized heaps on tables inside and outside of the shops.